Excellent condition! This saddle has been lovingly cared for and well-maintained, with minor signs of use and some natural darkening on the flaps. 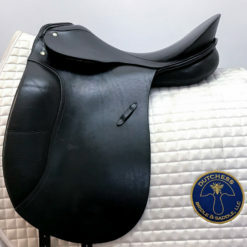 The Stubben Edelweiss is a close-contact jumping saddle, built on the Flat NT (new technology) tree with short tree points, a narrow twist, and a wider, flatter seat. This saddle has a very rich, military red color. The Stubben Edelweiss comes standard with deluxe doubled leather over the entire saddle for an extremely soft and grippy feel. 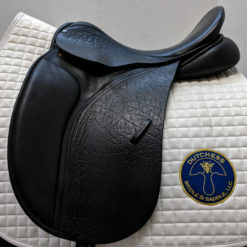 Sold with Stubben saddle cover. 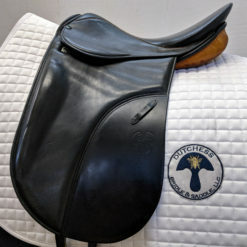 HORSE FIT DESCRIPTION: This saddle would fit a moderately wide, A shaped wither without hollowing behind the shoulders and has a moderate to level back. All saddle sales are final, so please take this saddle for a trial to ensure the best fit for you and your horse!